The House of Dior issued a press release for their 2017 Cruise collection. 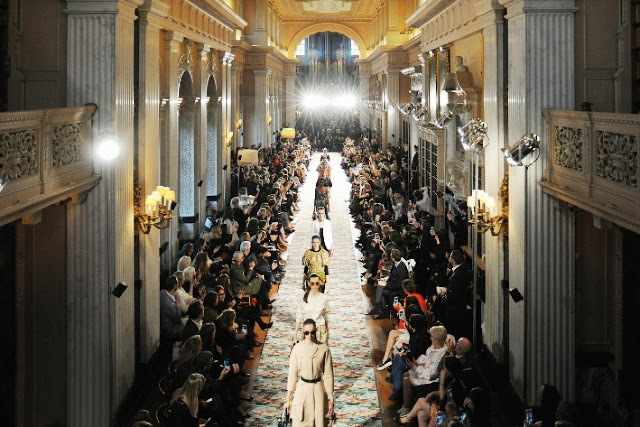 Dior Cruise 2017 was shown at BLENHEIM PALACE. The couturier provided the story behind the inspiration for the collection via BlogsRelease. So take a journey with a visual history of Dior and England and read a little more about it before you watch Dior's Cruise 2017 collection embedded at the end of this post. June 1, 2016 -- The inspiration was not only the post-war high society’s wardrobes, but also the restlessness and wanderlust that characterized the period: the urge to travel, to discover the new. English country life is expressed via the tradition of the hunt – its reflection in the decorative arts, rather than its reality. Shots of red are evocative of the hunting pink, rustic tweeds and crisp poplin of country attire, while nineteenth-century equestrian scenes are knitted into intricate pictorial jacquards or fused into English country florals. Those intermingle with rich devoré velvets and silks in Asian and African prints, patterns and embroideries, underscoring a mood of exploration, a curiosity about the world, and a fundamentally English eccentricity in dress – a story told through the cloth on your back. The conversation between France and England echoes a dialogue between the past and the present, creative exchanges between the two countries. In the eighteenth century, France adopted English fashions in a craze dubbed Anglomania; in the twentieth, the exchange reversed, and French fashions were exported for fevered consumption in Great Britain, none more so than Christian Dior’s New Look. Monsieur Dior frequently turned to the UK for inspiration: his own suits were tailored on Savile Row, and he used the masculinity of fabrics like English wools, Scottish tweeds and Prince of Wales check to underscore the femininity of his creations. Male meeting female, France joining England.